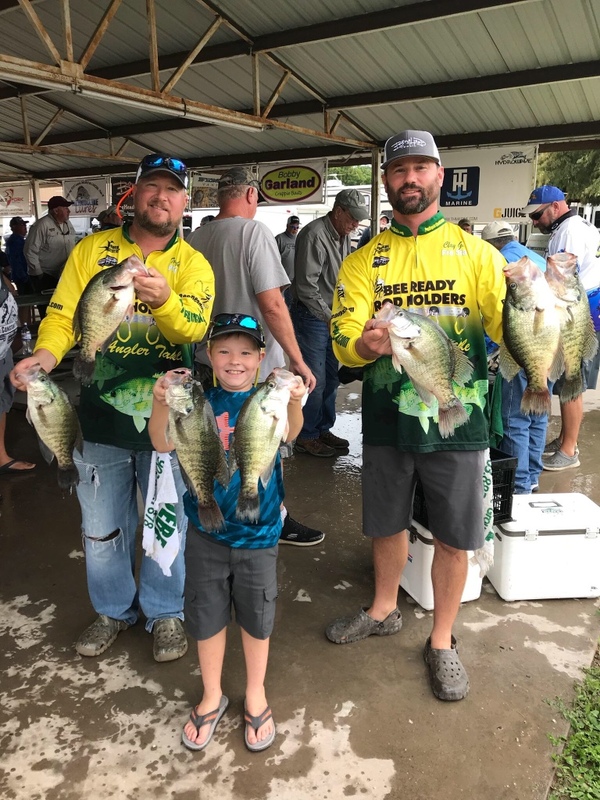 2019 TBH Crappie Get Together!!!! It's time again to start thinking about this year. This year we're gonna keep it the same timeframe as last year. Friday May 31st to Sunday June 2nd at scenic Lake Fork Texas. There's lots of places to stay there and plenty of places to eat. That time of year there will be 3 bridges on the lake holding fish in addition to brushpiles and laydowns and standing timber. It will be easier for some folks without good electronics to have more stuff to fish than just a bridge. Not to mention if you do fish any of those bridges that time of year you gonna get some crappie stolen by big green trashfish. It's pretty fun the first couple times it happen!! I'm staying on the W fork of the lake but fish both arms that time of year and Tawakoni is 15 miles down the road and a Great Lake for numbers of crappie but will never match Fork for size. Here's a couple teaser pics! I thought yall went to big sam? I'm interested. Do they allow low sided bay boats crappie fishing? Gonna try and make it again this year. Had a really good time last year. I'm in for sure. Just keep me posted. Never been to fork . Anything goes in Wood County!! That said I would find a trolling motor! I couldn't imagine doing what I do without one!! We did last year. Figured we would change it up some! Fork is a destination lake for folks so why not go there!! Are you gonna leave me and Chew on the bank again? Sounds great. You young ones have fun! Wish I was younger. Tag. May be able to make it. Can't catch them wading? Lol. I've got a trolling motor but I leave in the barn most of the time. I only use that thing 3-4 times a year. Bull crap your never to old come on. Throw me a bone slew never been there. I'll have room for a couple on my boat also. Would like to go again, but dont know if I trust my boat! Left me stranded in the cove last time...broke down right out of the gate. If we make it I'd have room for one. Maybe 2 if it was vertical jigging. I'll know more as the time approaches. **** T. G. Your the crappy man you got to make it. You can catch a mess in the shade that time of year! You got no scuses!!! BS!! You can lie and drink beer! You'll fit right in!!!! Maybe I can build the first 600HP outboard powered A/C crappie house with the floor cut out in the center? That would be a good build-n boat project! I'll just have to figure out what to do about a tolling motor for it. I may have to try to make this. Although I haven’t fished Fork a whole lot for crappie. I’m just gonna follow Slew around. For those that may have non-fisher women tagging along, that is also Canton weekend, just a short drive from the Fork/Emory area. The wife and I would love to join you if it all works out for us. Since I live close I might make this one...if I have not sold my boat by then. I'll make this one. Just moved my RV off the deer lease to an annual lot on Williams Creek. I'll have an open spot on the boat. It was a good time last year. I'm in. Pelican of paradise? I'm in Pelican. That's where we're gonna stay. I am definitely going to put this on the calendar and try to make it. Thanks for the heads up. Sounds like fun. Which RV park are y’all staying? I would like to make this an annual trip! I cant pass this one up being so close to home. I'll plan on bringing a boat so can help you out ultralite. If I have a boat by then Clay and I'll be going. Lake fork Marina on the W fork would be a good one. They have hotel rooms and cabin style places. Burning stump also on the W side is good. Scenic 515 between the forks isn't bad and Minnow Bucket on the E side is nice. Lake fork Marina has rental RV as well as tent spots available. A bait and tackle store and a good restaurant. I want in, but am boatless. Come up a week or 2 before! I still owe you anyhow. How do those low sides do when hung up on stumps? Cause that's gonna happen at Fork! Tawakoni not so much!! I'm in Paradise. Just moved in few months ago. Pelican was full but I got lucky with a real nice spot in Paradise. West side....Lake Fork Marina or Popes Landing. East side....Minnow Bucket or Oak Ridge. Stumps are not good for me. Lol If it's a stump field I'll bring an aluminum boat. Hope to be back in that area again to make it. That looks like a good place, they have a website. Radar The Texas lodge has room for 8 for around 500.00 a night. Who's in ?